I used Distress "Festive Berry", "Forest Moss" for the outside frame details and side edges, clear embossed the frame details. On the inside I used "Tumbled Glass". Stamped the quote with Versafine Black Onyx. 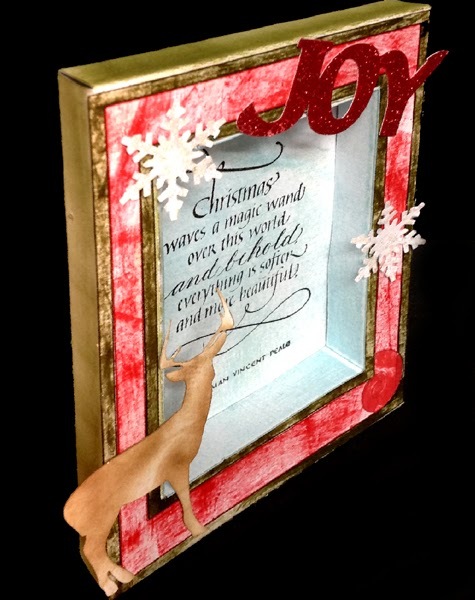 The word "JOY" was inked in red and Sticky embossing powder applied, heat activated and Ritz micro fine glitter (Regal Red) sprinkled on. 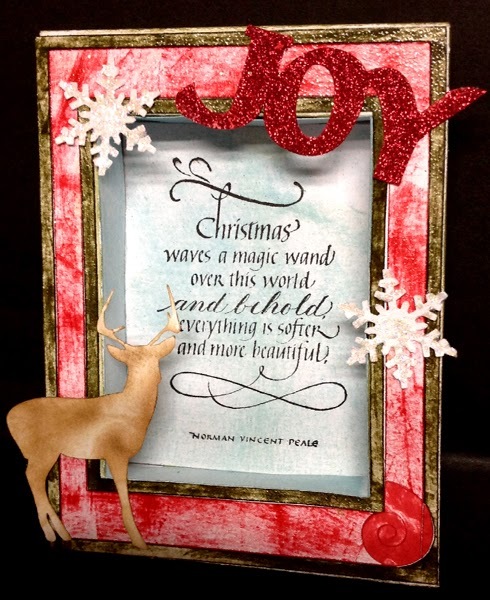 Snowflakes are Martha Stewart punched elements (although there are snowflakes available in the Silhouette file). Also embossed with Sticky embossing powder and sprinkled with Glitter "Crystal Snow" and then some Stickles "Star Dust" glitter. The deer was sponged with "Antique Linen" and then with a touch of "Vintage Photo". Gorgeous!! Where is the deer image from? I love it! TFS! Oh, haven´t done those box cards in ages. Now you got me inspired- thank you! Wonderful card and I like the sparkly red letters. Thank you for playing along with us at Delightful Challenges this week. Good luck and hope to see you back soon! Gorgeous card with a great design...thank you for sharing it with us at Divas by Design! This is gorgeous. Love the fabulous design, sentiment and embellishments. Beautiful, love the sentiment too! Thanks for joining us at Craft Hoarders Anonymous! Lovely....thanks for joining us on the Craft Hoarders Anonymous Challenge Blog. Your box is amazing! I love the elements and the sentiment is of course perfect! Thanks for joining us at Craft Hoarders Anonymous! What a beautiful item to display at Christmas and so beautifully made. Thanks for joining us. Marina. Creative Cutting DT. Love your shadow box, just elegant! Thanks for joining us at Craft Hoarders Anonymous! Thanks for sharing your fantastic project in our Not A Card challenge at The Crafting Cafe this month. Oh so pretty! Love all the details. Thanks for joining us again at Creative Cutting Challenge. We always love to see what you come up with!! so pretty just love your details!!! Thanks for joining us at Craft Hoarders Anonymous. I love the dimension and the detail you used. Very pretty! Thanks for sharing with us at Craft Hoarders Anonymous for our Box challenge!